HP is not launching new blade servers at its partner shindig this week in Vegas, but it is tossing out a new workstation blade that pairs a two-socket Xeon server blade with a sidecar that can hold up to eight Nvidia "Kepler" GPU coprocessors that are shared across those sockets. This would also make a killer base node for a supercomputer cluster if it turns out to be cheaper than the SL6500 scalable systems that HP is using to pair up large numbers of GPU coprocessors to dual-CPU nodes. The important thing is that Kepler GPUs have features that allow for the GPU to be virtualized - much as the CPUs have been for ages. So when you are creating a virtual workstation to pipe down to a thin client or PC from the data center, you can allocate more CPU and GPU to customers who need better performance and cut back for those who do not at any particular time. It allows for resources to be shared, and not just concurrently, but across different shifts. Moreover, you could also have customers use a basic VDI image for office work and then shift to a workstation VDI image only when they really need to run simulations or calculations that require all those GPUs. The feeds and speeds of the WS460c workstation blade were not available at press time, but word has clearly been making the rounds because Gromala says that "there are a lot more people interested in the WS460c than we can ship." That's a pretty good thing for a product that had not yet been announced. El Reg can tell you that the workstation blade uses Nvidia's Mobile PCI Express Module (MXM) connector for laptops, which suggests that it does not support the super-high-end Kepler GPUs but rather Quadro and GeForce cards. We will let you know when we find out more. The WS460c will be available in March with a starting list price of $5,037. 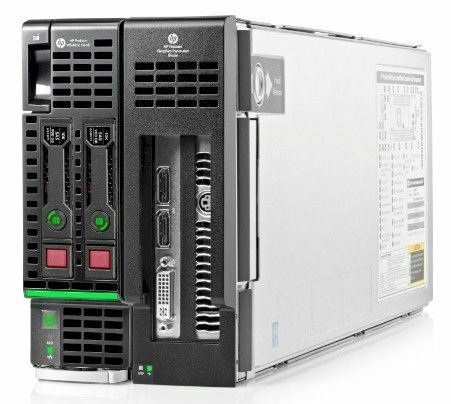 Back in September 2012, HP launched the chubby four-socket BL660c blade server based on Intel's Xeon E5-4600 processors, and along with that it also launched a special three-rank, 24GB DDR3 memory stick that is priced the same as a 16GB memory stick but offers 25 per cent more memory performance because it clocks faster and consumes 35 per cent less power. The memory controller in the Xeon E5 processors can support a certain number of channels and ranks per socket. With the SmartMemory, HP is sacrificing memory slots and cramming more memory ranks into a single DIMM, thus allowing it to boost the capacity of the DIMM by 50 per cent per stick. The upshot is that you can run the memory in a three-rank stick at the higher clock speed – in this case, at 1.3GHz – than you would be able to do with two-rank memory over a larger number of memory slots – in this case, you have to step down to 1.07GHz.